Revolutionary new modular beacon family EvoSIGNAL – the evolution of signal technology continues. Until now one of the big problems facing the designer or user wanting to select the most appropriate beacon for his application was the confusing amount of choice available from the manufacturer – WERMA included. The development of EvoSIGNAL brings simplicity and clarity to the selection process with the introduction of a completely new modular range of beacons offering a wide range of features in just three housing sizes. The new EvoSIGNAL family comes in just three different sizes – mini/midi/maxi – and covers both classic optical beacons and the audible/optical combinations. 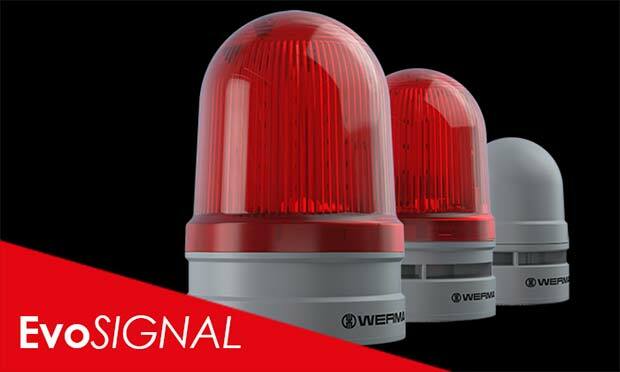 Fit, form and functional interchangeability with traditional WERMA beacons is ensured because the mounting hole positions in EvoSIGNAL are the same as in the old versions. So, instead of having to select from a vast array of beacon sizes – some higher than others, some with a slightly larger diameter than the next -, 20% fewer part numbers in the new family makes the selection process easy and uncomplicated. “In only three steps, the ideal signalling product can be easily found with the help of our Quickfinder or online configurator. Select size – choose the signalling effect, select the installation – and you’re done!” explains Simon Adams MD of WERMA UK. Incorporating the latest in bright LEDs with a wide range of audible outputs up to 110dB with the combination devices and an optimum IP66 protection rating the new EvoSIGNAL range offers the very best in class for a wide range of applications. The standard Twinlight feature allows you to select either a permanent or blinking light picture by switching a small dipswitch in the beacon.